Posted on November 28, 2018 December 11, 2018 by Timothy Minor Jr.
As a general rule of thumb, I try not to post more than two segments per week, and they’re nine times out of ten, posted at 11 am on the dot. Only on rare occasions do I break this trend, and a rare occasion this is. So, one of my all-time favorite R&B vocalists recently got hitched, and really, what kind of fan would I be, if I didn’t announce that, and then follow it up with a highlight? 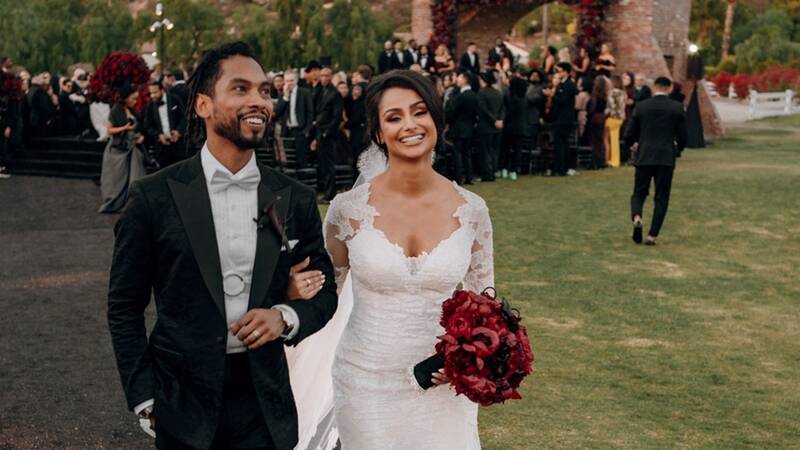 So, as promised, here is the announcement: If you did not already hear the news, let me break it to you, Miguel Jontel Pimentel and Nazanin Mandi have tied the knot!!! The couple were wedded on November 24, 2018 at Hummingbird Nest Ranch in Santa Susana, CA. Miguel and Nazanin met back when they were both 18 years old. She was interviewing him for a behind-the-scenes DVD he was putting out to promote his very first music video, when she asked him a question that wasn’t on her Q&A. The question being if he had a girlfriend. Real smooth, right? He flashed a debonair smirk, saying, “No, but I’m looking for one.” Even smoother! From there, they exchanged numbers, and he called the very next day to ask Nazanin out on a date (that’s how you do it my fellow guys. No games played). Since then, they had nowhere to go but up! A true love story at its finest. As someone who’s actually spoken with Miguel, I can easily admit, there truly is not anyone more deserving of this wonderful news than he. He is such a down to earth, well-rounded guy, with nothing to offer but positive energy, and when you meet genuine people like that, you cannot help, but to wish the best for them. Opening up about why he hadn’t rushed into matrimony, Miguel told Hot 97 in 2015 that he just “wasn’t raised like that.” “I think I’ve come so far as a man and I’m just starting to feel solid where I can be like, ‘You know what? I think I can hold this down legitimately.” I think now people throw things around like marriage. I just wasn’t raised like that,” he said. “I just follow my instincts,” he continued. “I think she’s learned that and she’s had to adjust and had to learn and also embrace. And I love her more for that.” I think we could all learn a lot from Miguel’s philosophy. Often times we rush into things because we have this socially given image in our brains of how things are supposed to be, even going as far as to compare ourselves to people that we’ve never even met. But timing is key. Not the timing of when other’s do things, or rushed timing from the pressures of society, or even family. At the end of the day, each and every person has only one life to live, so what’s the point of rushing through it? Comparison is often the thief of joy, and the goal is happiness and joy, right? Of course it is. So here’s to Miguel and Nazandi Pimentel, sincerely wishing you ALL the joy and happiness in the world! Good for them, they look really happy. This will probably help both take their careers to the next level.